Beautiful bird's eye-view of Boston harbor. This is an uncommon 1925 example of a George H. Walker's aquatint view of Boston Harbor. Centered on South Boston, the view covers Boston Harbor from East Boston and Nahant eastward as far as Squantum and Slate Island. The bustling harbor is shows full of ships and ferries traveling between its various islands and cities. Includes Thompson's Island, Castle Island, Spectacle Island, Governors Island, Deer Island, Lovell's Island, Calf Island, and Peodock's Island, among many others. Identifies various light houses including Boston Light, Bug Light, and Minots Ledge Light. Ferry routes are indicated. 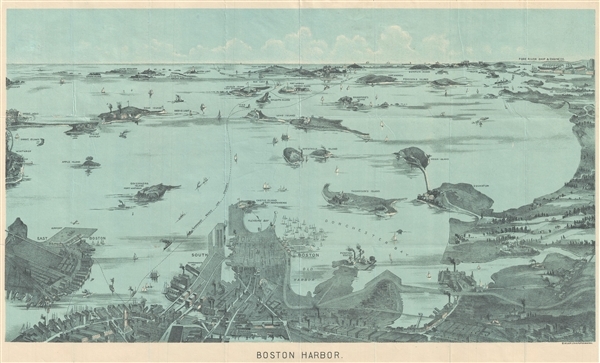 This map was published by the Walker Lithography Company, Boston, Massachusetts. Very good. Minor wear and verso repair along original fold lines. Accompanied by original binder.